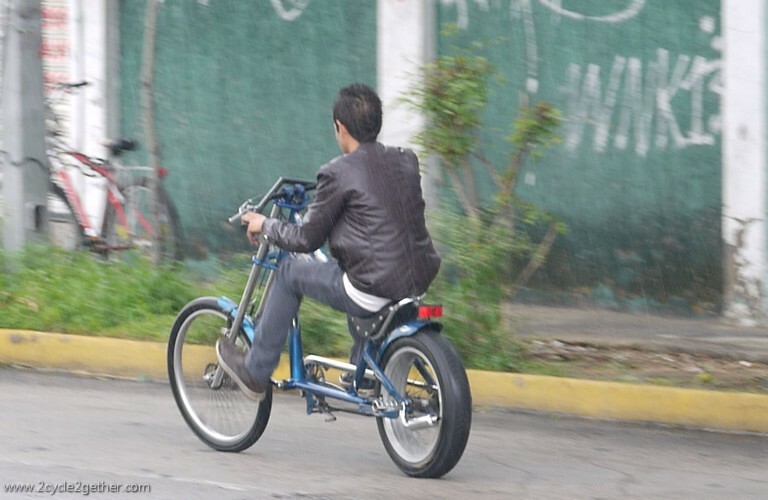 Guadalajara (Part 2) :: For the Love of a Livable City! 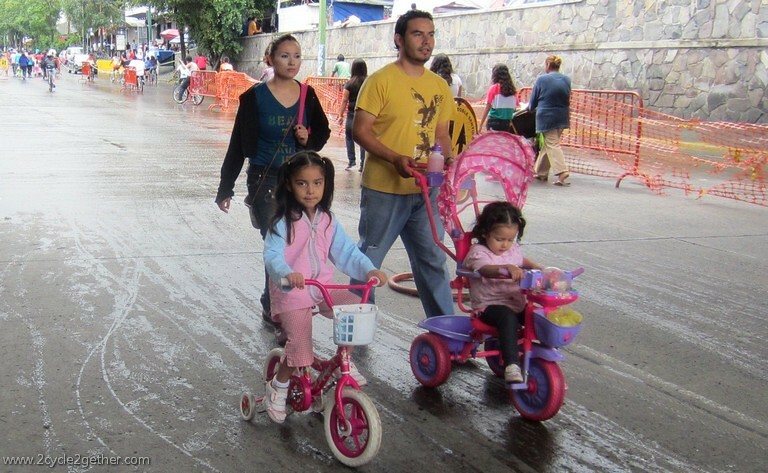 Cyclists of all ages come out to take over the streets of Guadalajara every Sunday. Long Live Via RecreActiva! 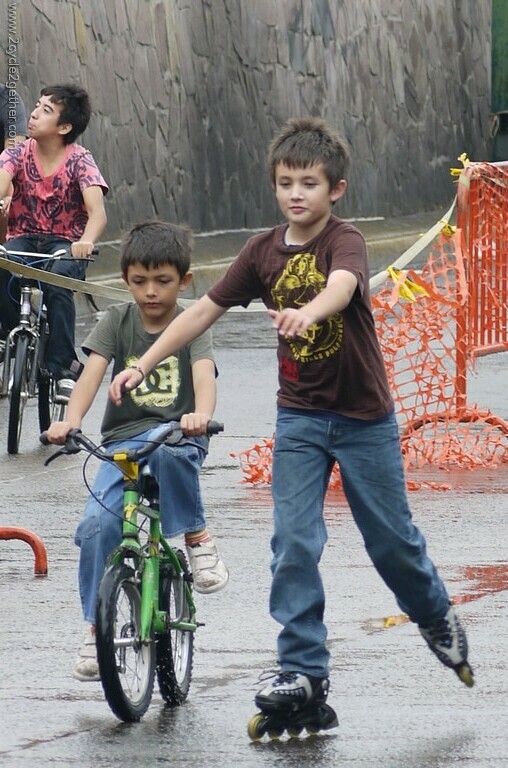 One of the things we especially loved about Guadalajara was the Via RecreActiva, an event that began back in 2004 and that occurs every Sunday. 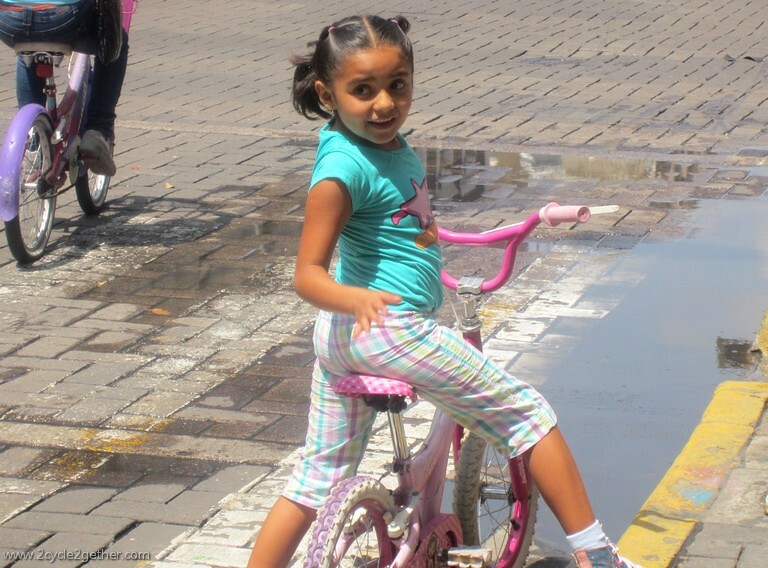 2 cycle 2gether Around the World :: Guadalajara Via RecreActiva from 2cycle 2gether on Vimeo. 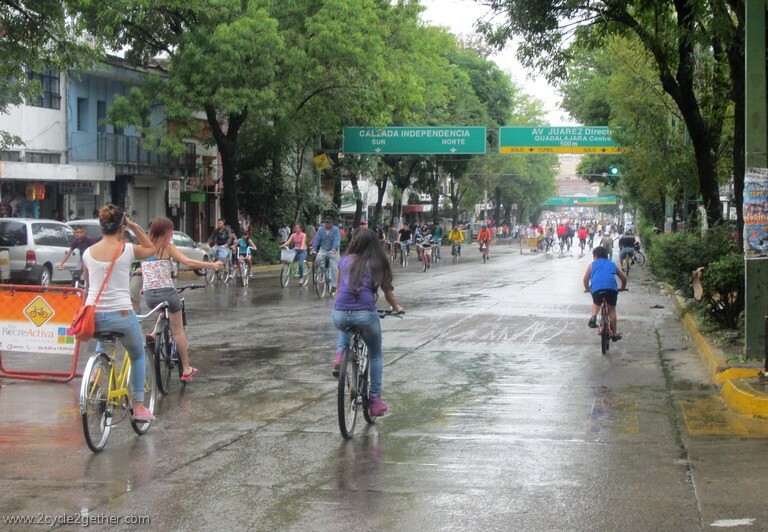 Of course, neither Via RecreActiva nor the many other group bicycle rides that take place in the city on a daily basis, would be happening without the diligent and persistent activism of many bicycle and pedestrian organizations in Guadalajara, like Cuidad Para Todos, GDL en Bici and COM:PLOT. Citizen activists along with members of the latter groups advocate for a more socially just and livable Guadalajara. From guerrilla creation of bicycle lanes when city planners don’t do it for them to installations of bicicleta blancas (white bicycles) on street poles to visually memorialize the death of a cyclist (27 cyclists have died so far in 2012 alone), they are fighting the age-old story of short-sighted city planners and an unhealthy car-enabled culture. While on tour-walks around the city, they even stop to highlight the most grievous errors in city planning and infrastructure, using spray-paint and stencils to highlight things like lack of access ramps for people with disabilities on the sidewalks and handing out ‘citizen tickets’ to drivers blocking sidewalks or otherwise violating the space of non-motorists. White Bicycles are hanging from posts throughout the city, memorializing the death of a cyclist in that location. 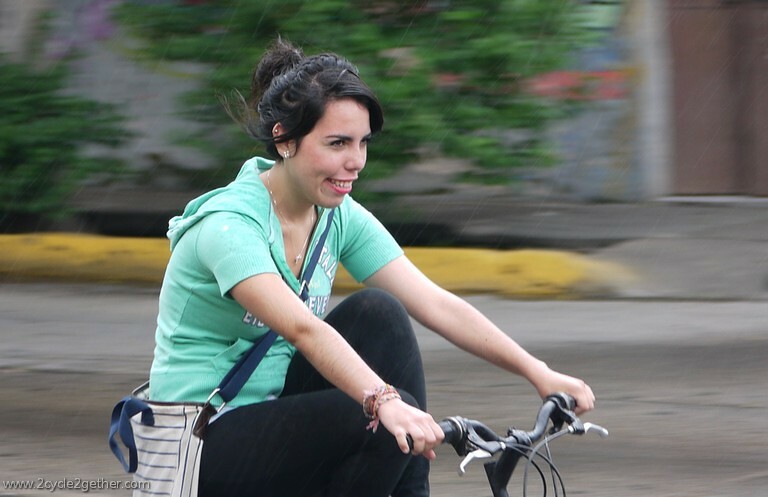 is a public-use bicycle rental program in Guadalajara. 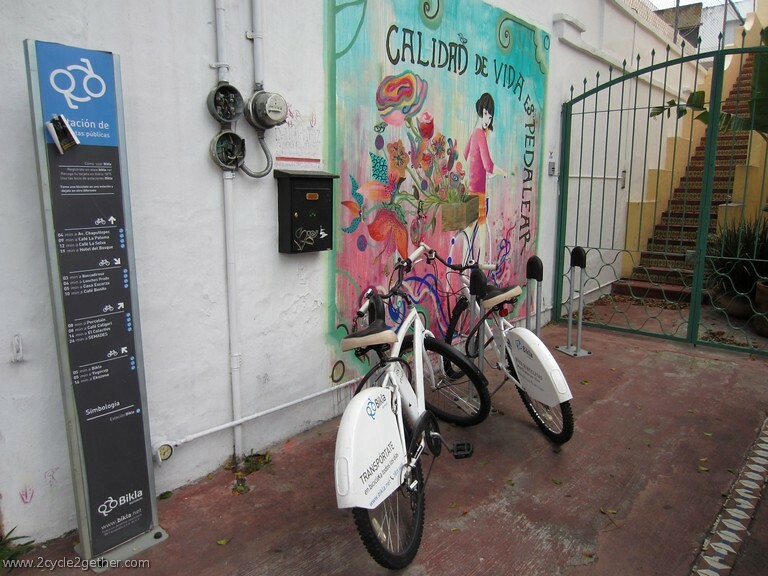 Once you register you can pick up a bicycle at any one of the numerous stations around the city and then return it to any of the other stations in the city. 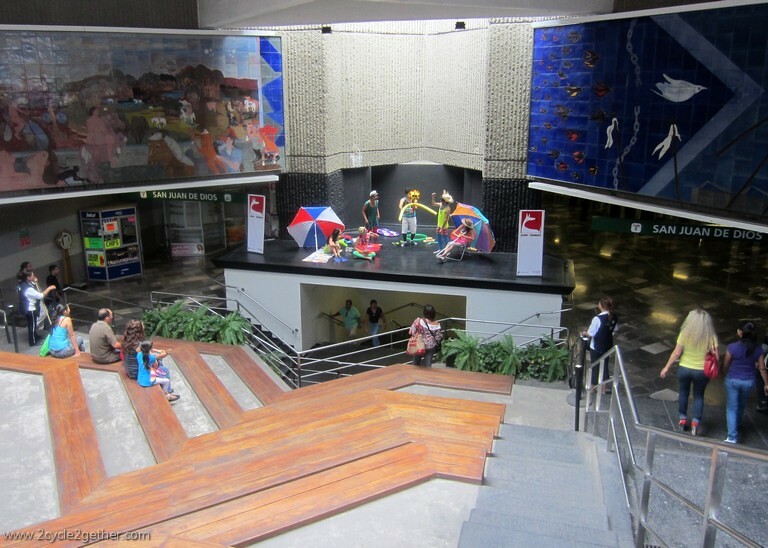 Although we didn’t ride the metro in Guadalajara we did notice that some entrances were built in a way that allowed for impromptu performances. The stairs doubled as seating and the roof over the entrance to the metro doubled as a stage. 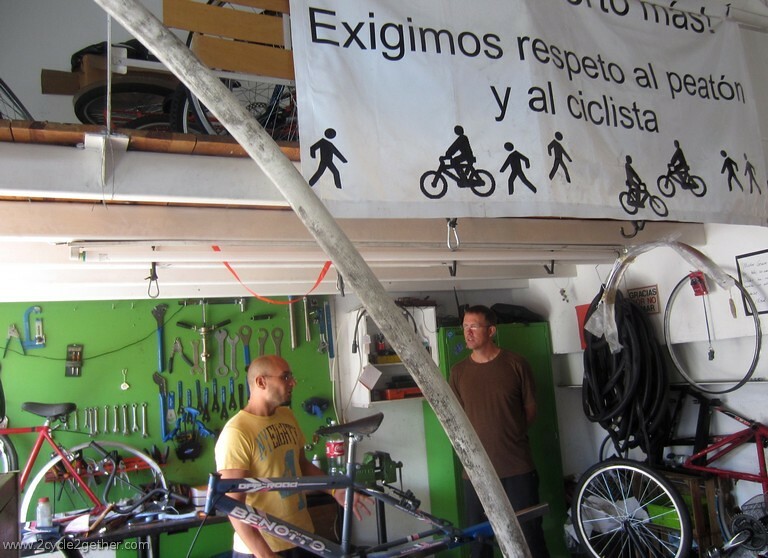 Kai & I stopped by to meet some of the GDL en Bici activists when we visited the infamously friendly Casa Ciclista (Cycling House) in Guadalajara. 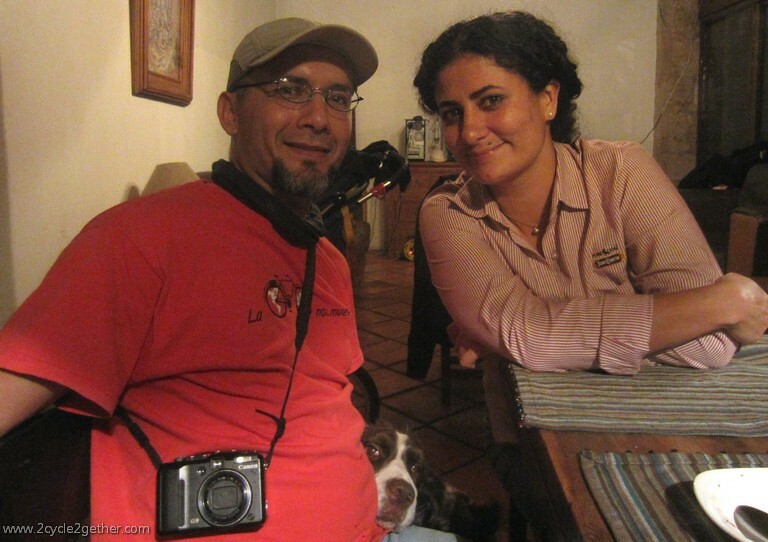 We had already met one activist on the day we cycled in to Guadalajara. Remember that hellish ride in dwindling daylight and pouring rain? Well, Maqui happened to see us cycling and she took the time to stop and make sure we had the Casa Ciclista phone number so we could call when we got to the city(what a sweetie!). She wasn’t the only one who was fabulous – we met Jorge, Bernardo and Marina, all of them spectacularly welcoming and helpful. In fact, they offer a place to stay to cycle tourists passing through so be sure to contact them if you need a few days in the city and you want to hang out with really awesome people. 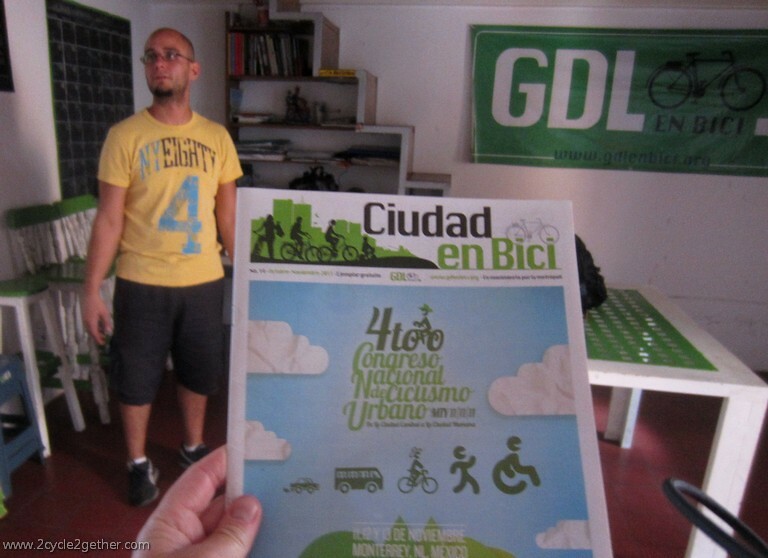 Cuidad en Bici is a magazine put out by GDL en Bici to raise funds for programs. 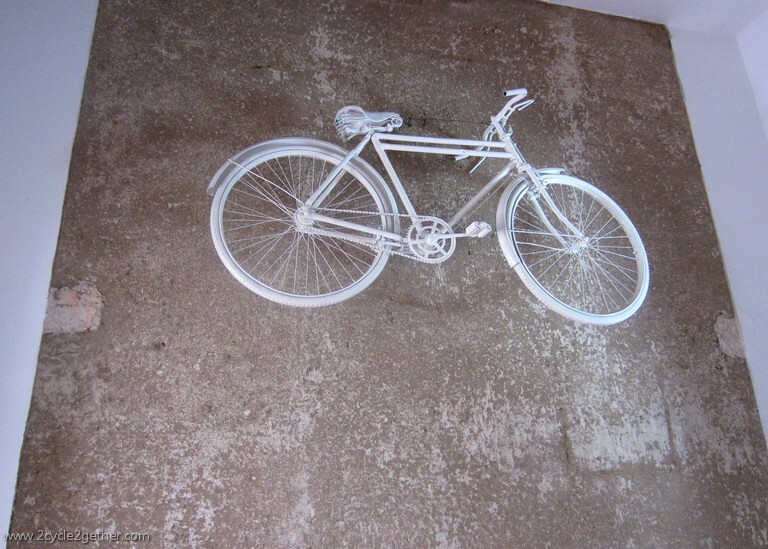 The “White Bicycle” wall in Casa Ciclista Guadalajara. As seen in Casa Ciclista Guadalajara. 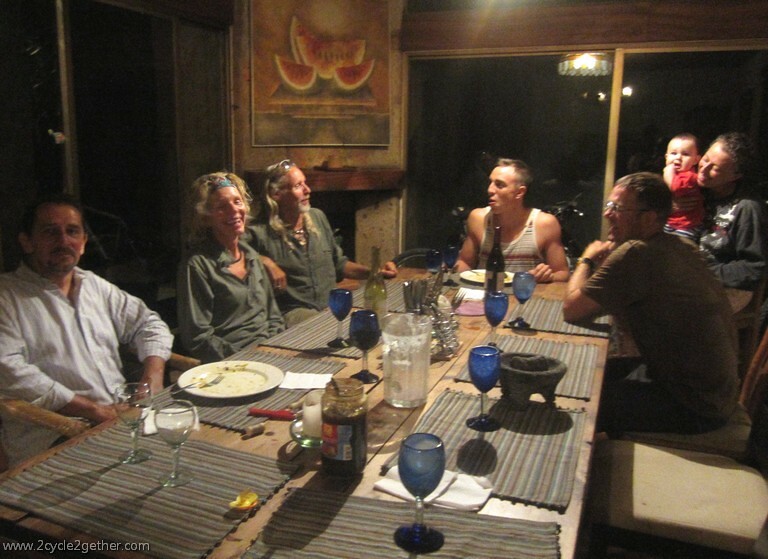 Dinner with Casa Ciclista folks & our friends Margit & James. Thanks Marina & Ernesto for so generously hosting a lovely dinner! 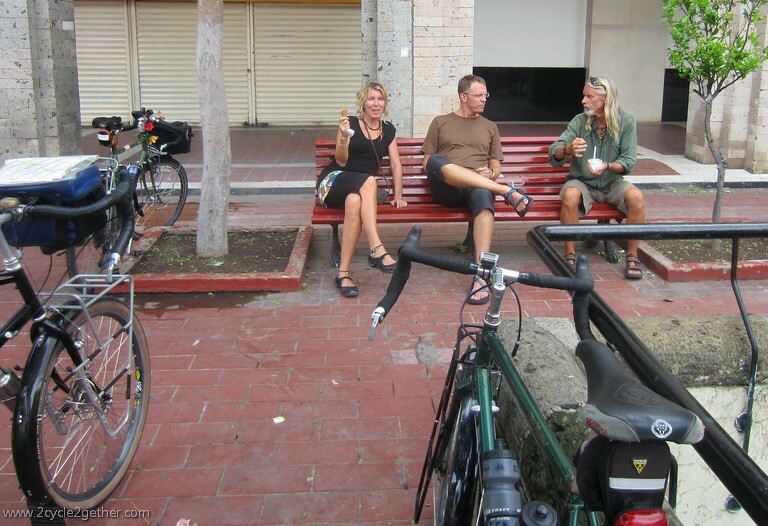 Probably one of the most serendipitous and wonderful things that happened to us while in Guadalajara was our random reunion with cycle tourists Margit and James. We met them, very briefly, back in December of 2011 as we were cycling down the Pacific Coast highway in California. They had pulled in to a state campsite late in the evening and were exhausted from a long day’s ride (over 100 miles!) so we didn’t get to chat much & we didn’t really even get a good look at each other in the dark. They left the next morning before we woke and all we knew about them was that they were on a short training ride in prep for a trip to South America in 2012. One Sunday, while cycling the Via RecreActiva route, we pulled off to use a restaurant’s bathroom and noticed two touring bicycles leaned up against the building. It didn’t take us long to find them in the crowd and we spent a good hour talking before we realized they were the same couple we had already met on the California coast months ago! Another two hours and an ice-cream/fruit break later and we were still on the streets talking (see what happens when you haven’t had a face-to-face conversation with other touring cyclists for months on end?!). What great luck to have randomly run in to them in a city of millions! Having ice cream with Margit & James, just after running in to them in a city of millions! 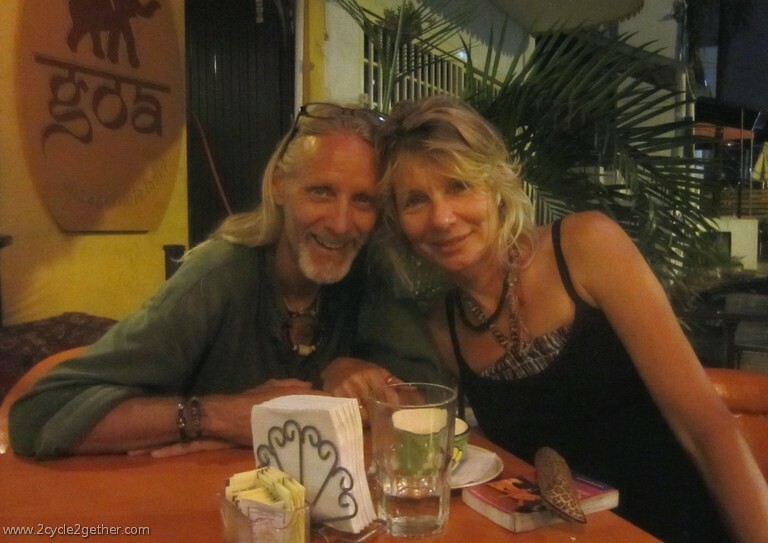 Having dinner at Goa with Margit and James. 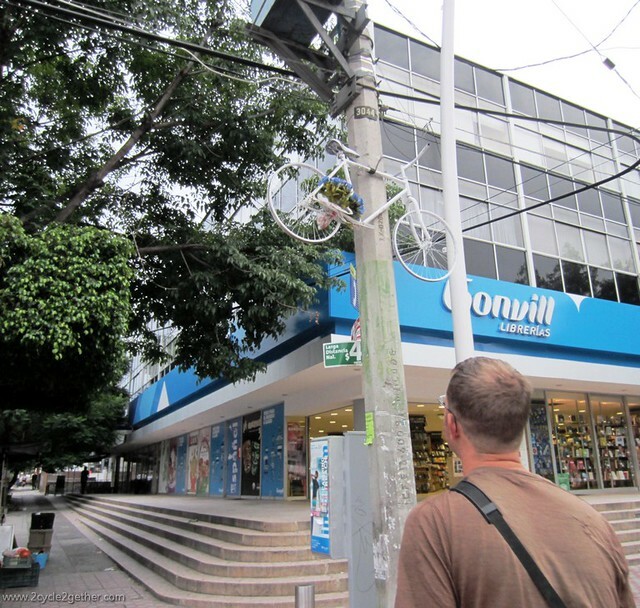 6 comments to Guadalajara (Part 2) :: For the Love of a Livable City! Hi Rudy! Thanks for visiting our blog! You’re comments are very true – the activists of Guadalajara are amazing but we are not associated with GDL en Bici or the other activists, although we did meet some of them while visiting Guadalajara earlier this year. We searched for the show you mentioned (Over the Wheel: Mexico) and watched it ourselves here. It was inspirational! I’ve forwarded your message to GDL en Bici via their facebook group so they could receive your wonderful comments. They also have a website if you’re interested. Hello guys, I was born in Mexico and lived there for 40 years until I moved to the US. Most recently to Louisville, Kentucky. I am now 52 and I have a passion for bikes. I miss my country very much and I literally cried when I watched the Guadalajara (part 2) video. It is awesome! 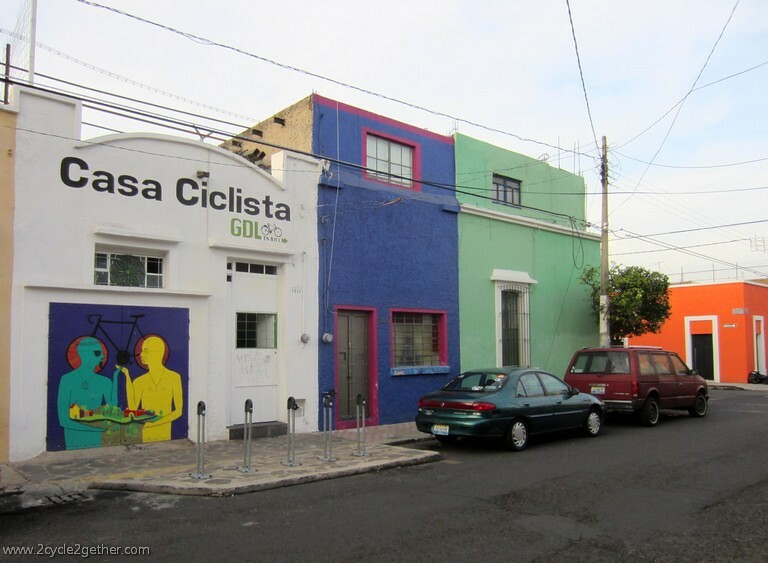 I am so happy to know there are nowadays people in my country like Casa Ciclista promoting the bike culture in Guadalajara and you guys doing the same! Thank you and Best of lucks!!! Thank you so much for saying hello and letting us know about your wonderful reaction to the video. It really is an awesome thing to see in person and to cycle with so many others – it’s just wonderful! 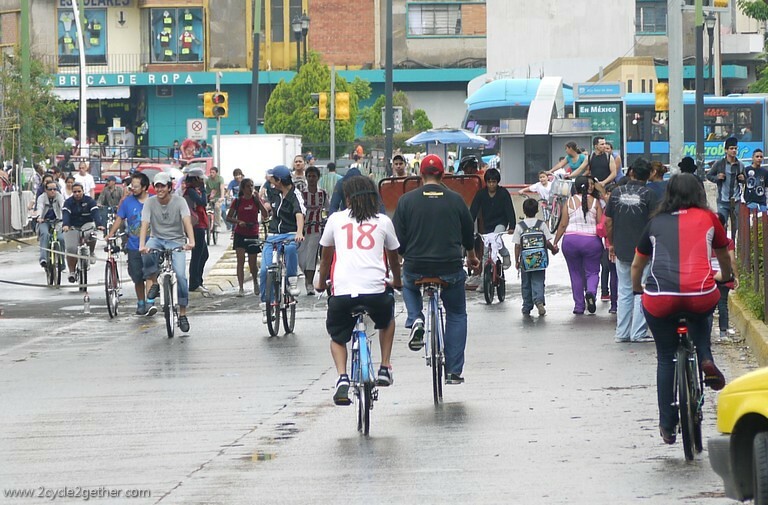 Via RecreActiva is something to replicate around the world and the activists and cyclists of Mexico are doing much to take the movement forward. It’s truly inspiring. We are absolutely in love with your country, from the generous people to the pace of life to the breathtaking land. 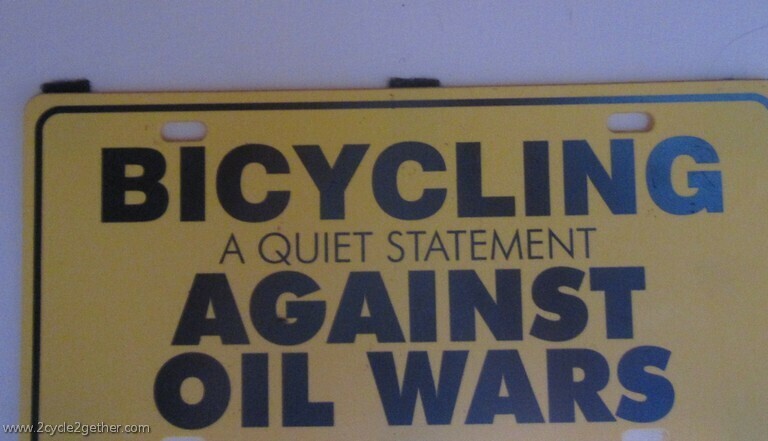 Plus, there are many who use the bicycle in this country. We can see why your heart misses it.